Vancouver, BC – Sabina Gold & Silver Corp (SBB.T), (“Sabina” or the “Company”) is pleased to announce final results from this year’s phase one, spring exploration diamond drilling program at its 100% owned Back River Gold Project in Nunavut Canada. A spring exploration drill program of 6,033 meters in 10 drill holes at six target areas on the Goose property was completed during early May. Drilling successfully tested target areas in and around existing mineral resources at the Llama and Umwelt deposits and stand-alone exploration targets outside of the known resource areas. Highlights from drilling, in addition to results previously released from the newly discovered high grade Llama Extension zone, include results from: 1) two drill holes that tested the Umwelt structure north of the high grade Vault zone; 2) additional up-hole assays returned from one of the high grade drill holes at the Llama Extension zone; and 3) results from the initial testing of the possible extension of the Goose Main structure (the Nuvuyak target) over 700m west of defined open pit mineralization. See Figure 1. ^ True widths of the intercepts reported are unknown at this time. ^ Capping for high grade exploration assay(s) is consistent with the resource statistics employed for mineral resources related to the respective deposit areas at Back River. Two drill holes, 18GSE532 and 18GSE534 were completed in an up-plunge position from the high-grade Vault zone. This drilling was aimed at better understanding continued high grade enhancements within lower portions of the Umwelt resource. Results confirm the continuation of the robust nature of the central Umwelt core and demonstrates further potential for extension of higher grade zones. 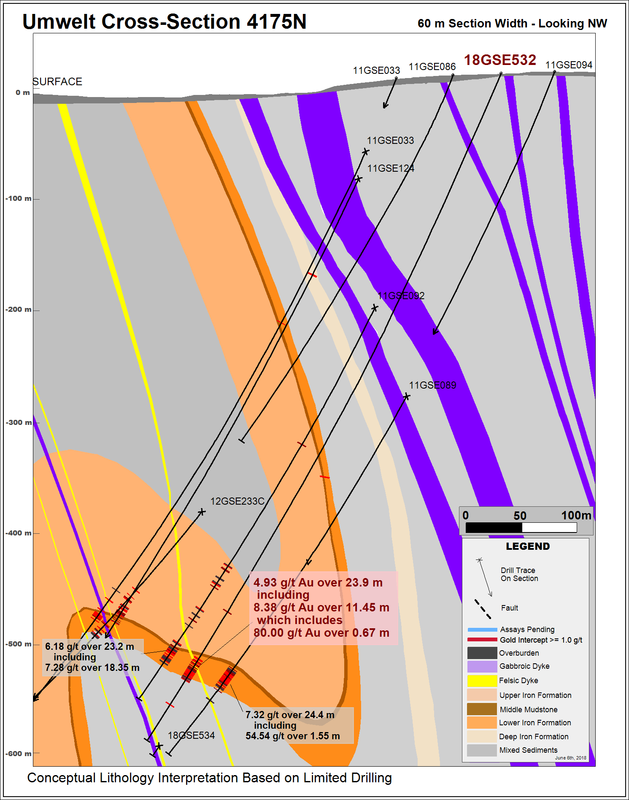 Drill hole 18GSE532 which returned values of 4.93 g/t Au over 23.90m, including 8.38 g/t Au over 11.45m (Figure 2) is located approximately 100m up plunge from last year’s drill hole 17GSE523B which returned 9.00 g/t Au over 28.7m (see news release November 2, 2017). Drill hole 18GSE534 is located 50m up-plunge of 17GSE523B and returned 5.24 g/t Au over 17.40m. At the Llama Extension zone, additional gold assay results continue to outline a significant high-grade gold endowment within a rapidly growing and important target area. Assays returned up-hole from the previously released main zone of 28.95g/t over 5.65m from drill hole 18GSE535 (see news release May 2nd, 2018) include 5.74g/t over 4.10m, 9.92g/t over 3.85m, and 7.25g/t over 4.50m (Figures 3). Each of these additional zones is yet to be fully characterized, owing to a limited amount of initial exploration, however the company believes that the identification of these zones only further highlights the significance of the Llama Extension zone. New intersections located within the discovery area now create additional exploration opportunities for gold zones within an expanded and growing gold system. The high-grade Llama Extension zone remains open in all directions and is now demonstrated at over 120m in length, returning intercepts up to 15.67g/t over 23.25m in drill hole 18GSE530 (see press release April 8th, 2018) and 9.48g/t over 38.55m in drill hole 17GSE516B (see press release September 5th, 2017). Sabina has now confirmed the presence of positive exploration elements including significant gold values up to 9.50g/t at the favourable Nuvuyak target. 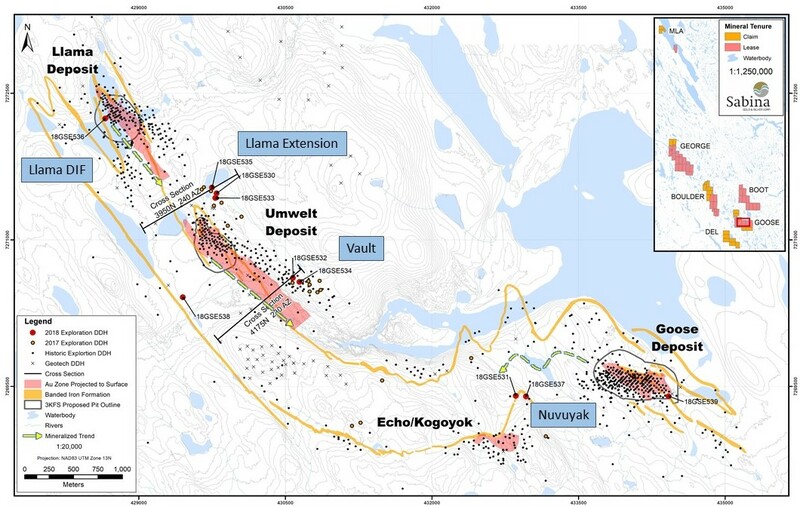 The Nuvuyak target, located approximately 700m down plunge to the west of the Goose Main deposit, is modelled as a potential large-scale extension to the current structure associated with the Goose Main deposit. Drilling of two exploration holes down plunge has now confirmed the location of key exploration elements including; iron formation, multiple felsic intrusive units, and significant gold mineralization. Drilling of these initial vectoring holes has been highly successful and represents an integral step in forwarding Sabina’s exploration approach for the target where the company is focused on unlocking additional gold discoveries while demonstrating the long-term potential for resource growth at Back River. The phase two program is planned for commencement in late June to follow up on the 2018 spring drilling results. The program will include up to an additional 10,000m of diamond drilling complimented with a series of dedicated field exploration programs that will consist of regional and detailed mapping, geochemistry, and geophysics. Drilling programs will focus as a priority, on the Llama Extension zone and Nuvuyak target where highly favourable growth opportunities continue to gain momentum. Additional targeting is also planned to include the areas proximal to the Umwelt and Echo deposits at the Goose property, and the Vega and Humpback targets of the Boulder property. Sabina Gold & Silver Corp. is an emerging precious metals company with district scale, advanced, high grade gold assets in one of the world’s newest, politically stable mining jurisdictions: Nunavut, Canada.The Company is well-financed with approximately $92 million in cash and equivalents. The Project received its final Project Certificate on December 19, 2017.The Project is now in the final regulatory and licensing phase. This news release contains “forward-looking information” within the meaning of applicable securities laws (the “forward-looking statements”), including our belief as to the extent, results and timing of exploration programs and various studies including the FS, and exploration results, reserves estimates, potential production from and viability of the Company’s properties, production and operating costs and permitting submission, timing and receipt of necessary permits and project approvals for future operations and access to project funding. These forward-looking statements are made as of the date of this news release. Readers are cautioned not to place undue reliance on forward-looking statements, as there can be no assurance that the future circumstances, outcomes or results anticipated in or implied by such forward-looking statements will occur or that plans, intentions or expectations upon which the forward-looking statements are based will occur. While we have based these forward-looking statements on our expectations about future events as at the date that such statements were prepared, the statements are not a guarantee that such future events will occur and are subject to risks, uncertainties, assumptions and other factors which could cause events or outcomes to differ materially from those expressed or implied by such forward-looking statements. Such factors and assumptions include, among others, the effects of general economic conditions, commodity prices, changing foreign exchange rates and actions by government and regulatory authorities and misjudgments in the course of preparing forward-looking statements. In addition, there are known and unknown risk factors which could cause our actual results, performance or achievements to differ materially from any future results, performance or achievements expressed or implied by the forward-looking statements. Known risk factors include risks associated with exploration and project development; the need for additional financing; the calculation of mineral resources and reserves; operational risks associated with mining and mineral processing; fluctuations in metal prices; title matters; government regulation; obtaining and renewing necessary licenses and permits; environmental liability and insurance; reliance on key personnel; the potential for conflicts of interest among certain of our officers or directors; the absence of dividends; currency fluctuations; labour disputes; competition; dilution; the volatility of the our common share price and volume; future sales of shares by existing shareholders; and other risks and uncertainties, including those relating to the Back River Project and general risks associated with the mineral exploration and development industry described in our Annual Information Form, financial statements and MD&A for the fiscal period ended December 31, 2016 filed with the Canadian Securities Administrators and available at www.sedar.com. Although we have attempted to identify important factors that could cause actual actions, events or results to differ materially from those described in forward-looking statements, there may be other factors that cause actions, events or results not to be as anticipated, estimated or intended. There can be no assurance that forward-looking statements will prove to be accurate, as actual results and future events could differ materially from those anticipated in such statements. Accordingly, readers should not place undue reliance on forward-looking statements. We are under no obligation to update or alter any forward-looking statements except as required under applicable securities laws. This news release has been authorized by the undersigned on behalf of Sabina Gold & Silver Corp. 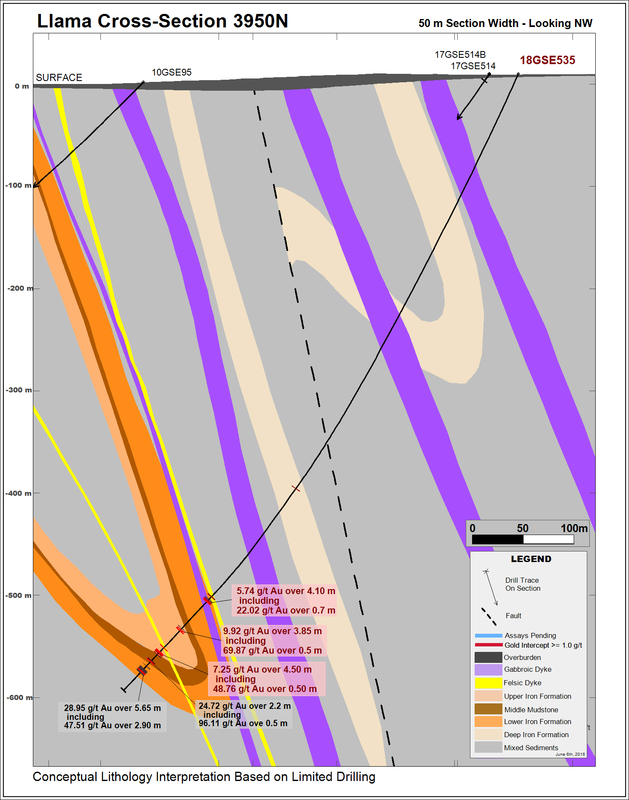 Figure 1 – 2018 Drill Hole Locations with Main Targets and Gold Trends.